Our Patron, the Right Honourable Helen Clark (then Prime Minister of New Zealand) signed the Ypres Agreement on behalf of the New Zealand Government together with the Flemish Government in October 2007. That agreement resolved to cooperate in “…increasing broad community recognition…educating younger generations…honouring the war dead…preserving heritage material…and encouraging tourism to commemorative and historical sites in Flanders and New Zealand.” The Ypres Agreement inspired the Passchendaele Memorial Museum to create a travelling exhibition in 2009 entitled “Passchendaele: The Belgians Have Not Forgotten”. This exhibition was sent, free of charge, to New Zealand where it visited Wellington, Christchurch, Dunedin, Featherstone and the National Army Museum in Waiouru before finishing its journey in Auckland. The wonderfully successful exhibition was staged at Fort Takapuna and attracted more than 10,000 visitors. 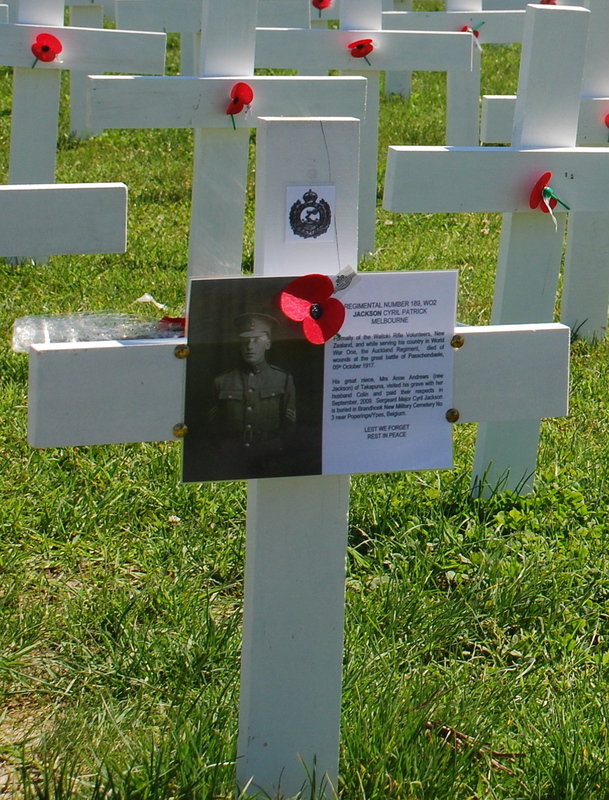 5,000 white crosses were erected on the old parade ground, as the exhibition progressed those crosses became decorated by family members with photographs and details of those who had fallen. The anonymous crosses turned into personalised remembrance symbols. Campbell Live covered the exhibition in 2009, click on the following link and then click on Video to see the program – Campbell Live. Radio New Zealand also covered the exhibition with a radio interview with Lode Notredame and Iain Mackenzie, founding members of the Passchendaele Society. To hear the interview click here and learn more about the New Zealander’s involvement in the Battle of Passchendaele. The success of this exhibition in turn inspired a dedicated group of enthusiasts’ to form the Passchendaele Society 94 years after the epic battle from which we take our name took place – 12 October 1917 became New Zealand’s worst ever military disaster, with 846 young New Zealanders killed on just one day. The Society’s aim is to ensure that all New Zealanders are aware of the role played by New Zealand at the Western Front and in particular at Passchendaele, Belgium.